Hot new sci-fi thriller Prey is out today and, after spending a large amount of time with both the free demo and the full game, we've come away with really positive impressions. Be under no illusion, the world of Prey is no soft sci-fi built for kids. The world that you step into as the protagonist is dark, gritty and incredibly hostile. It also has its own consistent and well-realised history and lore that adds genuine weight and gravitas to the events you are witness to and enacting as you play. If you want to know how Prey plays then think of a hybrid between Half-Life and System Shock. The relentless tension and horror from System Shock, as well as a serious inventory for you to manage, is in residence, as too the hazard suited, mostly silent, scientist protagonist and frenetic FPS action from Half-Life. Prey is also a game from Arkane Studios, the masters behind the awesome Dishonored series. All the company's usual hallmarks can be found in Prey, including good writing, artistic flair and a penchant for allowing players to make their own decisions and have the game shift around them and change accordingly. 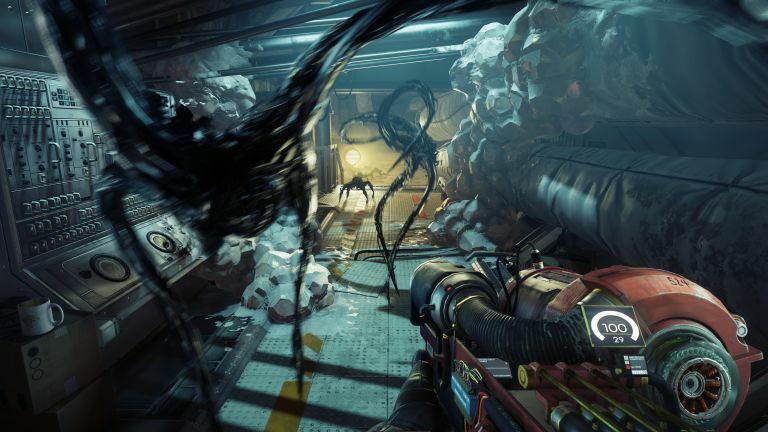 From the game's super cool GLOO canon, which fires hardening glue that can incapacitate enemies or create platforms from which the player can reach previously inaccessible areas, to neat recycling machines and EMP grenades, Prey is stuffed full of neat gadgets, weapons and technology for you to find and utilise. Serious customisation of the player is possible in Prey, from gender right down to individual, specialised skills like dismantling, hacking and gunsmithing, you really do get to create the character you want to play as. Key attributes such as strength, stealth and agility can also be customised, granting you new abilities to aid exploration and combat. And talking of customisation, the suit you wear and the weapons you used can also be significantly modified and augmented. Like cementing enemies with the GLOO canon? Then why not improve its ammo capacity, reload speed or range with some weapon modification kits? Or maybe you would prefer to blow things away with a max damage specced shotgun? One of Prey's neatest features is its open, Metroid-style structure, with the game basically a massive sci-fi dungeon that the player can explore in the way they want. As such, providing your skill is high enough you can head immediately to some of the game's harder areas if you want, while if you prefer to explore the deepest, darkest areas before progressing down the main story, then you can do that too. And, talking of exploration, it is without doubt one of the best things about Prey. Exploration isn't easy, with hazards and enemies to be overcome, however it is incredibly rewarding, not just in the weapons, items and augmentations the player can discover, but also in terms of information that can be acquired, with the more you explore the more story pieces you get to help you figure out what is actually happening in the game. Prey also has an almost old-school taste for jamming secrets, Easter eggs, and hidden content into its game world. This juxtaposition of sci-fi horror with some genuinely neat and clever nods and winks to other properties is really refreshing and adds another dimension to the risk-reward mechanics of exploration. And, last but not least, you can hit things really, really, hard with a wrench in Prey. Like Gordon Freeman had his trusty crowbar, you have the Hephaestus "Heffy" Twist & Loop Industrial Wrench, an absolute beast of tool that not only helps you fix broken machinery, but also helps you brutally dispatch enemies. For more information about Prey then head on over the game's official website. Prey is available to buy now on PS4, Xbox One, and PC.